And of course I had to swatch one right away, despite having to go to bed early tonight. I decided to go with the prettiest ugly color out of them, and that was Hyperspace Bypass. 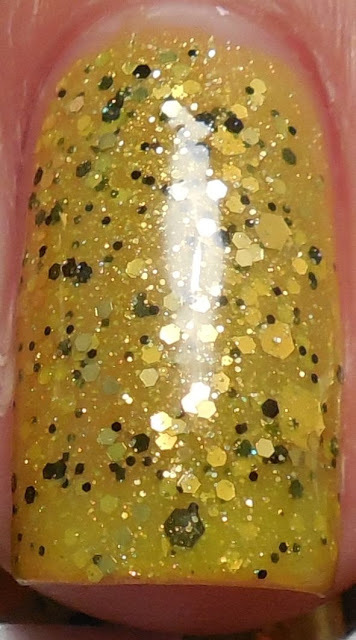 It's a chartreuse yellow jelly with gold, white, and black multi sized hex glitter. I love me a pretty ugly polish! Application was super easy, and I was stoked that I didn't have to use any undies for this because I had a full bottle to use. I used two layers and found very little dragging or clumping of the polish with each stroke. The glitter is really dense so some dragging is expected. I finished with a layer of Gelous and SH Insta Dr because it did dry bumpy on its own. Wow, what an amazing creation, look at that macro!! I can't even begin to describe what's in that polish other than the few glitters I mentioned earlier. Hyperspace Bypass is such a beautifully complex polish, and I am excited to check out the rest of my order... but not until I get some downtime early next week. Boooooo for having to wait. This Nerd Lacquer order came just in time, especially since I received some really terrible news earlier. These Nerds brightened my day tremendously! And for next time, are there any Nerds that you'd like me to swatch first? ?